A little interlude from my vacationing posts, this is random and out of the blue, but figured what the heck. There will be a pending move in the near future, before the end of 09. Here are the zones I’ve outlined by preference. 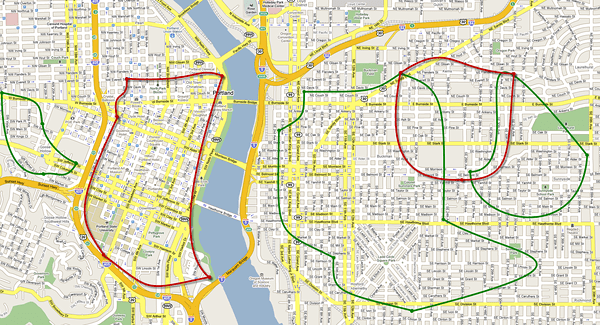 Green areas are priority locations, red are secondary locations, and everywhere in Portland is AWESOME. :) So it is a really hard decision, but we’ll definitely be bouncing about to a new location. I’d really like to stay on the east side, as would Jo, but the Goose Hollow area is in such a perfectly strategic location for business, logistics, and Portland life in general. Then of course I really like the idea of being along the new light rail alignment somewhere. We’re not sure yet, but will be figuring it out soon. Any Portlander’s have any suggestions, thoughts, ideas, etc? More areas that we might want to check out? I’d love to be along the light rail or streetcar, but it is a higher priority to be near certain other items – as listed below. Proximity & number of transit options. Proximity of wi-fi enabled establishments that are cool to hang out at; i.e. Backspace, Stumptown, etc. Maximum uniqueness. i.e. I want authenticity in the people, shops, restaurants, and such in the immediate surrounding area. Minimal “cookie cutter” or “ticky tacky” type construction. There is of course minimal in the entire area this map shows, but I don’t want a view of a single McDs, Taco Bell, or some other generic dump like that. Ease of engaging in business meetings, meeting others for entertainment, and location of entertainment sources – i.e. movie theaters, etc. The location of residence absolutely must have multiple transit options nearby. We’re going car free for sure now, and I don’t want to even contemplate needing one for anything. Thus the west side of the river is looking optimal in that sense. However, the east side has never required more than one trip a month – at most – in a car. You could always go live near my old house (SE 72nd & Flavel St.). Very close to two Fred Meyers, Trader Joes and the new green line. Jo would have a total fit if I even suggested we go past 39th. 🙂 She has this strange invisible barrier thing about 39th. Funny thing is, when we lived downtown, it was the river, now that we’re on the east side, it is 39th street. So I might just propose some areas a little further out.